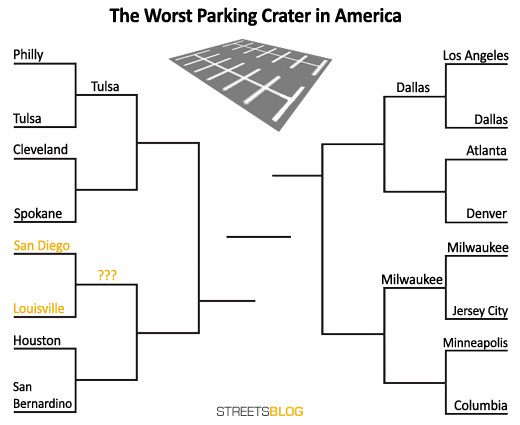 This week we’re really getting into the thick of our Parking Madness tournament, the hunt for the worst parking crater in an American downtown. Today’s match-up features a Kentucky river city that has done a number on its downtown and a California beach city with a weak spot for asphalt: It’s Louisville versus San Diego! Don’t forget to vote at the bottom. This submission comes to us from Patrick Smith (@cityresearch on Twitter). Note that the grey boxes represent real buildings that haven’t been uploaded yet to Google Earth. A conservative estimate shows that (probably) at least a third of Louisville’s downtown surface area is occupied solely by parking. This is a city, Weber said, that’s been betting on mega-projects to revitalize its downtown while ignoring the street-level issues. A common but very avoidable mistake. This area — part of San Diego’s downtown waterfront — was submitted by reader Jason Tinkley. Hard to believe, but all this parking is right next to the harbor — presumably marring some very valuable and otherwise picturesque land. There’s only so much oceanfront property convenient to a major city center in America, and here are several acres of it where people can store cars for $1.25 per hour. 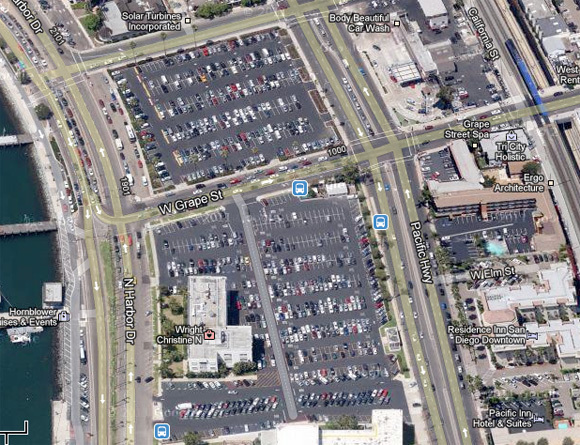 On to the voting: Tell us which of these parking fields is the most objectionable. Yesterday, Dallas beat Los Angeles, advancing to the second round along with last week’s “winners,” Milwaukee and Tulsa. I’m going with San Diego for the wasted opportunity of oceanfront redevelopment. The San Diego example overlooks their harbor, not the pacific ocean. How Kansas City isn’t in your sweet 16 is a glaring oversight. Final four material. I’m voting for San Diego. The harbor has even limited space than the Ocean by a large order of magnitude. The harbor view is beautiful, but it is discouraging to walk between the downtown and the harbor due to the fast streets to cross, noise, and as you pointed out sea of cars in between. Surely, we can balance the need to park with preserving our natural beauty. San Diego makes me sadder (seems like more of a loss) but downtown Louisville just seems like a pedestrian nightmare so it edged out a win (loss?). The San Diego County Administration Center Waterfront Park will convert the large 8-acre on-grade parking lots north and south of the historic Administration Center to a large community and regional open space amenity. The park will include large civic greens, children’s play area, intimate garden rooms and an expansive interactive fountain. Parking will be provided in a new underground parking garage off of Ash Street. Thank you for bringing this information to light!! This San Diego waterfront parking lot is becoming a beautiful PARK as we speak. Sorry Luisville. 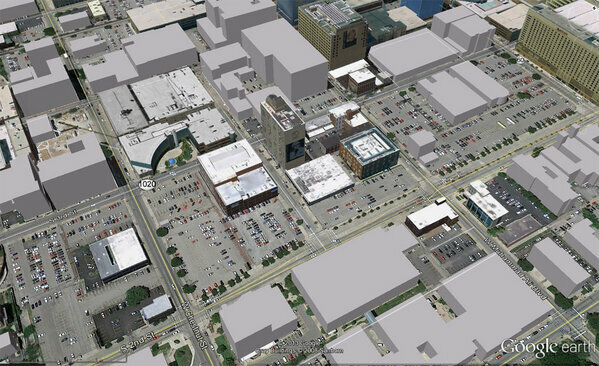 I am in favor of Louisville in the overall scope given that it is one giant surface lot. The elite 8 in this challenge will be quite tough. Wow, this is going to be a huge improvement. Good work, San Diego! Interesting information with great details given. ofcourse Gatwick Valet Parking is the best service to be used. Perfectly written piece of information. Managed Parking Gatwick aslo makes the airport more attractive and nice.